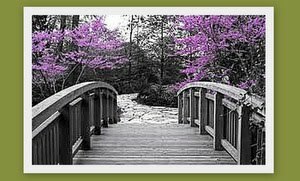 Madison Coupon Connection: Get your FREE Coffee-Mate Coupon on Feb 4th! 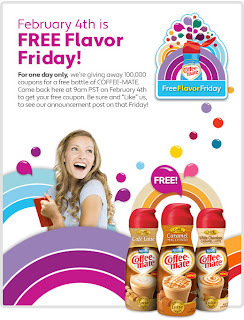 February 4th is Coffee-Mates "FREE Flavor Friday!" At 11:00am central time, Coffee-mate will be offering 100,000 coupons for a FREE bottle of Coffee-Mate! Visit Coffee-Mate's website or Coffee-Mate on Facebook (after 11:00 am Central time on 2/4/11. ), to get your coupon. ...Be aware these deals do tend to run out very quickly! UPDATE: This offer has ended. However, you may still be able to get a $1/1 printable coupon from the Coffee-Mate Facebook page (use it on a double-day to get very inexpensive or FREE Coffee-mate...maybe even a moneymaker!) You should be able to print the coupon twice. Whew! I finally got through to request my FREE Coffee-mate Coupon! The site was getting slammed due to the high volume of traffic. I hope you were able to get yours!